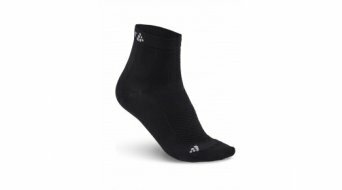 Lightweight and thin socks that can be used individually. They adapt perfectly to the foot and thus cause no pressure or friction points. A special mesh ensures optimal moisture management and ventilation. Cooling socks with tight compression fit, elastic arch ring and wide and elastic cuffs. They reduce muscle vibration and support the movement process, without restricting it. The compression ensures that the body does not acidify too quickly and thus a shorter regeneration phase is needed. Ideal for before and after the workout.